I don’t like the Flipped Classroom approach because its foundation is in flipping lectures from classwork to homework.There are two problems with that. Not only should families not be forced to bring school into the home, but there is a growing body of research shared by education thought-leaders like Alfie Kohn, Peter Dewitt, Ira Socal, and Joe Bower that says there’s little to no benefit in doing so. When this is pointed out to flipped classroom proponents they often carry on about the model being more than lecture-driven homework. Especially, they explain, for those who have evolved to flipped classroom 201 or 2.0. But for those teachers who are enlightened to know that homework and lecture are not best ways to support learning, why hang on to a term rooted in that? Now, I don’t take the changing or abolishing a term lightly. I still use the term PLN even as it was falling out of favor and I no longer use the term differentiated instruction even when it was rising into favor. 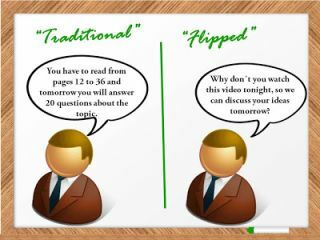 But I’m not flipping over the term flipped classroom because the very root of the model (video lecture-based homework) is built on a foundation that is neither innovative or best for children. Defenders of this approach insist that homework and lecture are not necessarily crucial components of the flipped classroom model and instead say it is the idea of student-centered learning. Now I’m a fan of learning that is customized to student’s passions, talents, interests, and abilities, but that has been going on effectively for quite some time without videos, lectures, or homework at the core with models like the Schoolwide Enrichment Model (SEM), Montessori, and Big Picture Learning (BPL). Proponents of flipped classroom talk about how their in-class time can be spent working with students rather than lecturing and that is great. Really it is, but as Gary Stager points out, in many cases the flipped classroom is a preposterous unsustainable trend, masquerading as education reform, in which kids are forced to work a second unpaid shift because adults refuse to edit a morbidly obese curriculum. When I look at these classrooms I still see kids grouped by date of manufacture. I see homework being done in class, which is better than home sure, but it's still not real-life work or passion-driven work. I don’t see students having lectures that are customized to their learning style, passion etc., and, well watching videos just isn't revolutionary. Ask the kids who have known for years that they can learn from watching videos if only their schools didn’t block YouTube or ban them from bringing in their technology. Not only that, kids are often really good at finding videos that best appeal to their learning styles rather than the one-size-fits-all videos shared by most flipped teachers. It has nothing to do with videos, or homework, or the latest fad in education. It has everything to do with who owns the learning. And, that's the point...there are already several terms for that. I like to call it learner focused.